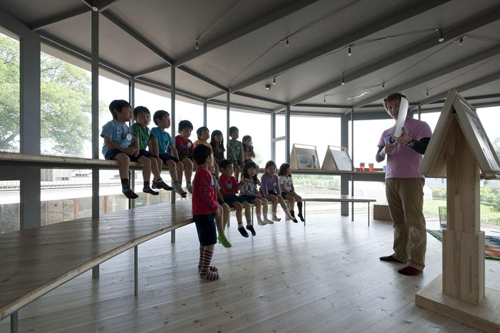 A playful addition to one of my favourite early childhood centre designs: Fuji Kindergarten by Tezuka Architects. 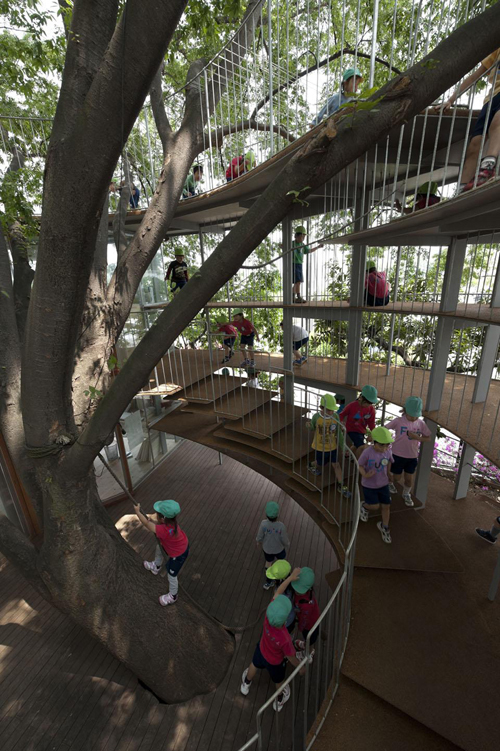 "Ring around the tree" is built between the existing early childhood centre and the street, offering a structure for play, foreign language instruction and an area for the children to wait for the bus. The space appears to have just two floors, but for the children then structure has six floors with volumes that are just one meter high. The compressed spaces, which can only be reached by crawling, further the freedom of movement and ability to use the body as a means of learning. The space was designed with built-in furniture, leaving much free space. 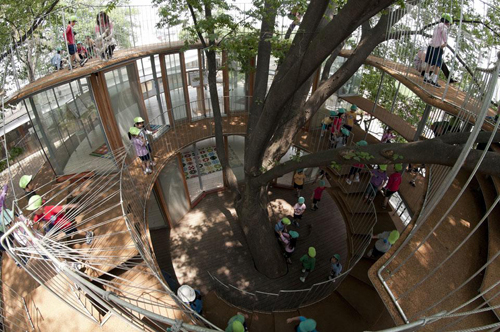 The structure is of a wood and transparent glass volume spiraling upward, enveloping a Japanese Zelkova tree - a tree which has a history, as told by domus: "Planted more than 50 years ago, the Zelkova in the Fuji Kindergarten was hit by a typhoon and almost uprooted. The tree dried out completely but recovered despite general disbelief. Older residents of the area remember this Zelkova because it was the only tree to be used by children for climbing and games even before there was a kindergarten. 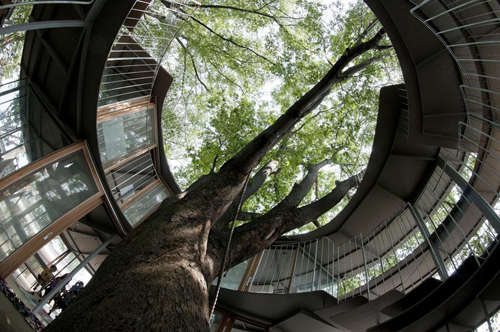 And before the construction of "Ring Around a Tree," a small tree house had been built in the Zelkova. 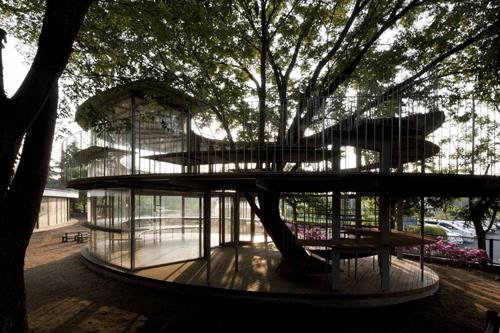 A "place-playmate" for several generations, as well as temporary shelter from rain and sun for children waiting to go home, in its latest adventure, the Zelkova becomes the natural subject—and living element—around which the Tezuka's design takes shape". In 'Philosophical Investigations', Ludwig Wittgenstein writes that what children and foreigners have in common is the absence of knowledge of language and a set of codified rules. This means they must follow their senses - their body. 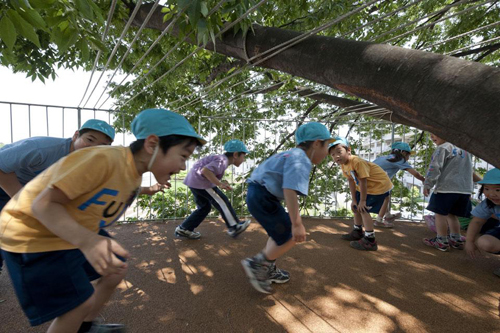 The directors of Fuji Kindergarten requested the architects to design spaces without furniture, to give more freedom to the children - thus 'Ring around the tree' liberates the body from strictly defined space.